Adroitly handcrafted wooden box is perforated with multiple eye catching designs. It is furnished with a flat wooden strip as a lid at top to open it snugly. Fancy Wooden Box with Drawers .Price is from Rs 110/- to 1200/-depends on Wood, size, shapes, finish n polish, velvet lining etc. - Printing Handling: Embossing, Glossy Lamination, Matt Lamination, Stamping, UV Coating, Varnishing, Embossing, Glossy Lamination, Hot Stamping etc. Description : Attractive Wooden Boxes can be used to keep miscellaneous things like jewels, cosmetics and more. 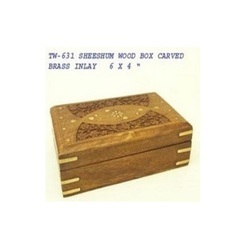 Item Size : 8"x6"x3", 7"x5"x2.5", 6"x4"x2"
Fine Decorative Wooden Box Drawer With Brass Work Available In Different Designs & Sizes. We are able to gain immense expertise in offering Wooden Boxes to our customers. These products are developed utilizing optimum grade raw material, which is sourced from trusted vendors of the market. The offered boxes are available in customized designs and shapes at reasonable rates. We are offering a wide range of Decorative Wooden Boxes made out of wooden pieces to enhance your lifestyle. They come in various sizes which may be custom made or the traditional one. We believe in providing satisfaction to our clients in their budget. 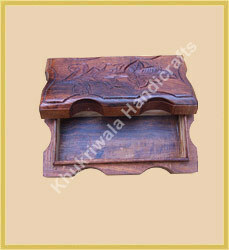 We are engaged in best quality of wood boxes that ensures reliability.